Hardcover, 9 x 11.5 in. / 272 pgs / 180 color / 50 bw. 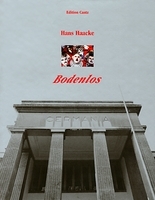 Text by Hans Haacke, Benjamin Buchloh, Rosalyn Deutsche, Walter Grasskamp. When Hans Haacke was awarded the Peter Weiss Prize in 2004, he called Weiss' writings "courageous interventions, driven by moral outrage." Since the early 1960s Haacke himself has been a socially engaged artist. Living in New York since 1965 (born Cologne, 1936), he has participated in the public debate through his sculptures, installations, paintings and photographs, as well as by his writings and teaching. In 1971, several works for a solo exhibition at the Guggenheim Museum were deemed "inappropriate" by the Museum's director and he cancelled the show (one was an exposé of the real estate empire of a New York slumlord. At the 1993 Venice Biennial, the artist broke up the marble floor the Nazis had installed in the German pavilion and he displayed the replica of a 1-DM coin minted in the year of German reunification above the entrance. 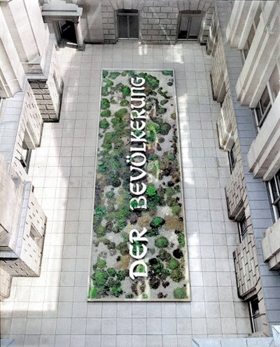 His 2000 installation DER BEVÖLKERUNG (To the population), a work in progress in the German Parliament building in Berlin, also makes reference to the Nazi past but, in addition, addresses contemporary issues of citizenship and the integration of foreign-born residents. Recently, several works have paid critical attention to the Iraq war. 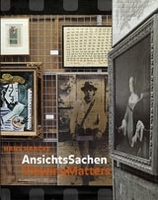 This publication was produced for a 2006 retrospective exhibition at the Hamburg Deichtorhallen and the Akademie der Künste in Berlin. It offers a survey of Haacke's works from 1959 to the present. It includes a selection of his writings and essays by Benjamin H.D. Buchloh, Rosalyn Deutsche and Walter Grasskamp. Artwork by Hans Haacke. Text by Walter Grasskamp, Klaus Bumann, Grace Glueck. FORMAT: Hardcover, 9 x 11.5 in. / 272 pgs / 180 color / 50 b&w.